It was 2009 and I was sitting in the lobby of my London hotel with a friend. We were waiting for something – I no longer remember what – but while we waited, an array of premium Ben & Jerry’s ice creams stared at us, beckoning us from within phosphorescent glass. Bored and tempted, we walked towards the humming vending machine. 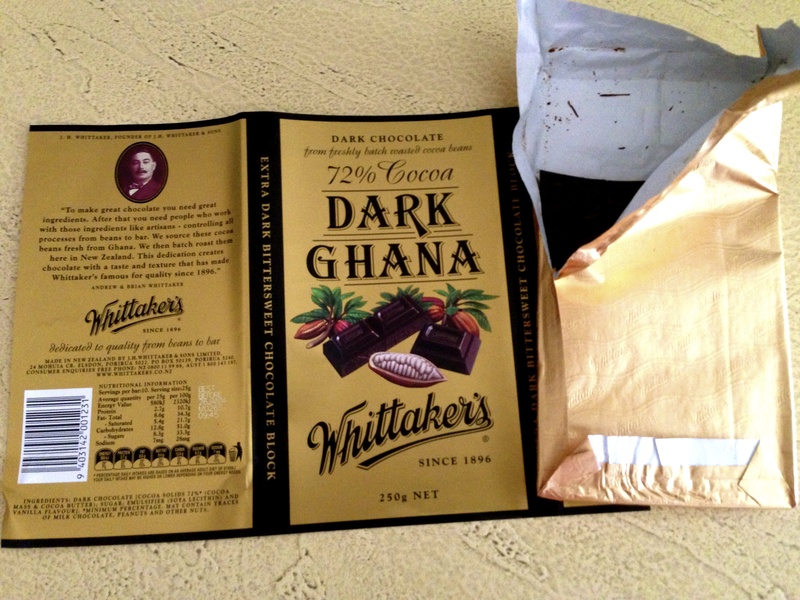 All the flavours were a blur to me – all except one: milk and cookies. In went the coins and out shot a pot of one of the greatest, most classic flavour combinations around. I didn’t want that tub to end. For years, my family kept cookies & cream ice cream in the freezer and it was always devoured quicker than any of the other flavours. We don’t buy ice cream much nowadays and I don’t often eat a lot of cookies & cream flavoured things now either – it just sort of disappeared after a while. It may be this marked absence that explains why this particular flavour combination came to me so strongly when I decided to try out my very first mousse. I couldn’t find a recipe that gave me what I wanted so I decided to marry two recipes together to create a silky, airy vanilla mousse speckled with chocolate cookies. *Sourced from foodnetwork.com. I halved the original recipe and this was enough to make about 12 small to medium sized cookies. Cream butter and sugar together until light in colour and fluffy. Beat in egg and incorporate fully, then mix in vanilla extract. 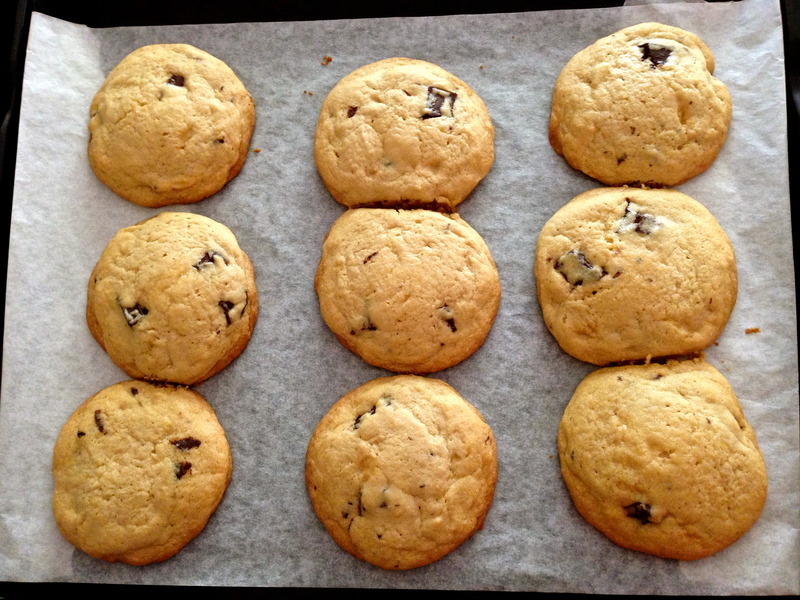 *If you’re increasing this recipe to make more cookies, beat in each egg individually. Sift in the flour, cocoa and salt and mix until just incorporated. 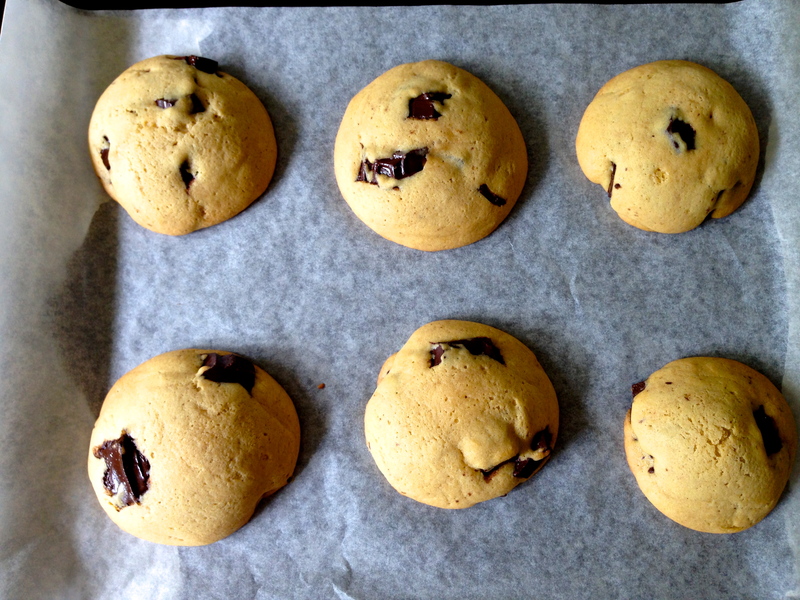 You can refrigerate the dough for about an hour or you can do what I did and just bake it straight away – separate the dough into small balls and squish them gently onto an oven tray lined with baking paper. Bake for 15 to 20 minutes. Take out of oven and let cool on a rack. In a mixing bowl, beat together the creme, vanilla bean and 1/4 cup sugar with electric beaters until the creme forms soft peaks. *If this makes any sense, I usually whip cream until the ripples created from the beaters stay in place and look nice and thick, kind of like cake batter. In a separate bowl, beat the egg whites with electric beaters until soft peaks form. Gradually add 1/4 cup of sugar, tablespoon by tablespoon, while continuing to beat the eggs until thick and glossy. Crumble 2 or 3 cookies into the cream mixture and fold in. Then fold the egg whites into the cream until everything is just incorporated. Place in fridge for about 6 hours, or overnight. This makes 3-4 servings. It’s quite a sweet dessert for my taste but it just melts in your mouth and the cookies I made had a bitterness to them, which cut through the sweetness of the mousse really nicely. The real positive aspect of making this was how much easier it was than I thought it would be. I’ve always hated beating egg whites and my attempts at making things with egg whites – meringue, souffle – haven’t really turned out that amazingly. In comparison, this was pleasantly successful without being stressful, complicated or time-consuming. Shows like Masterchef and My Kitchen Rules have taught me many, many things about cooking but perhaps one of the greatest lessons has been the importance of mastering timing. Too much time in the oven and that beautiful (and expensive) beef tenderloin overcooks, becoming less tender and more dry and tough. Too little time and that pork belly that’s meant to melt in your mouth is a rubbery, chewy, downright nasty slab of greasy meat. Desserts too rely immensely on correct timing, where one minute could mean the difference between serving your guests a molten chocolate cake that oozes when you dig in with a spoon or just another chocolate cake. I was faced with this scenario when my friends and I gathered for a potluck dinner. Tasked with dessert, I chose to recreate my previously successful chocolate fondant with the addition of some almond biscuit crumble and vanilla mascarpone cream. 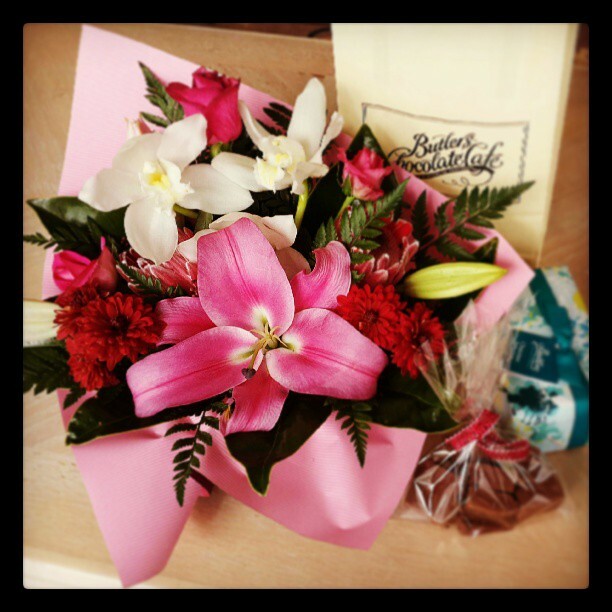 I erred on the side of caution with my timing and failed to deliver exactly what I wanted. The recipe I followed for the cake was one by Nigella Lawson. I used less chocolate – about 300g, whereas the recipe calls for 350g – and it was very rich but I think I would use the recipe again. It tasted really nice and it was really easy to put together, PLUS no left-over egg parts! I also used a muffin tin because I didn’t have enough ramekins of the same size to serve everyone. I repeated what I did the first time I made these cakes, which was to brush melted butter in every dish and then sprinkle with some cocoa powder. This helps immensely when it comes to removing the baby cakes to serve. The cakes only needed about 10 or 11 minutes but I cooked them for about 13 minutes. They had been sitting in the fridge for a few hours so I thought they would need those extra couple of minutes but it was too much and they ended up only being a little bit gooey in the middle with no molten flow of chocolate whatsoever – disappointing! I got this from a recipe cooked on the latest season of My Kitchen Rules. In hindsight, this made way too much crumble and it was a bit tasteless so I would decrease the amount of butter, flour and almonds by maybe 50g and keep the same amount of sugar. For the mascarpone cream, I just whisked together 200g of mascarpone with about tsp of vanilla extract, ground vanilla bean (I have pure vanilla beans in a grinder) and about a tbsp of icing sugar. This goes great with a rich dessert like chocolate fondant. There was a lot of silence during dessert time and plenty of compliments about the taste, which makes me very happy but there’s no denying it: they were hardly chocolate fondants. Chocolate fondant, lava cakes or molten cakes lose their identity without that melted centre and it can be a gamble to get them out of the oven at the right time in order to achieve the right consistency. That’s just how it is with cooking I suppose and it is a bit of a mix between a fine art and sheer luck to get the food just right. It’s all a matter of trial and error – I’m sure my friends won’t mind being taste testers! Use all the sugar? Definitely not. Fudge, brownies and various slices are things that I generally don’t choose to eat and my mind doesn’t give these items much more than a cursory acknowledgement of their existence whenever I come across them. I’m not 100 per cent sure of why that is but it might have something to do with the fact that I find them incredibly rich, sweet and not very filling. I did, however, have a fair bit of evaporate milk left over from when I made pumpkin pie and I wanted to use it up before I inevitably spill the can all over the inside of my fridge. 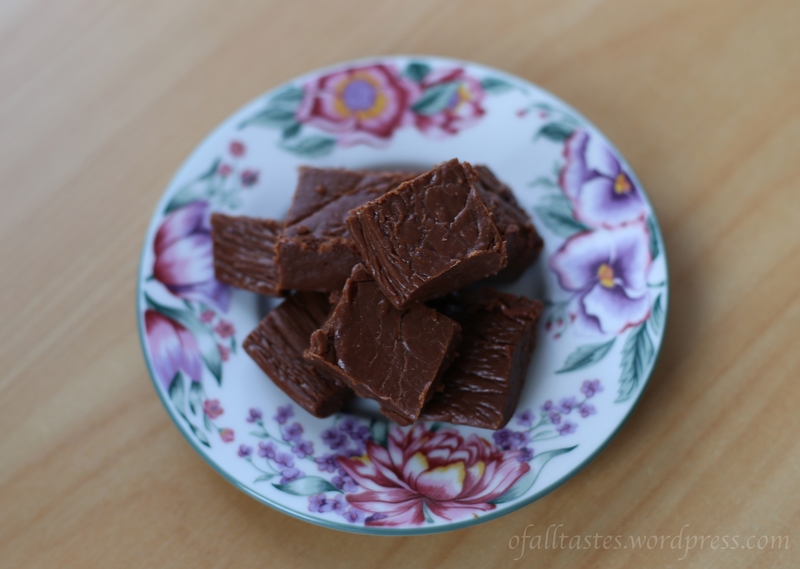 A quick Google search gave me this recipe for chocolate marshmallow brown sugar fudge, which surprisingly tickled my fancy (I think it was the marshmallows ;)). The process, as I followed it, wasn’t complicated at all. 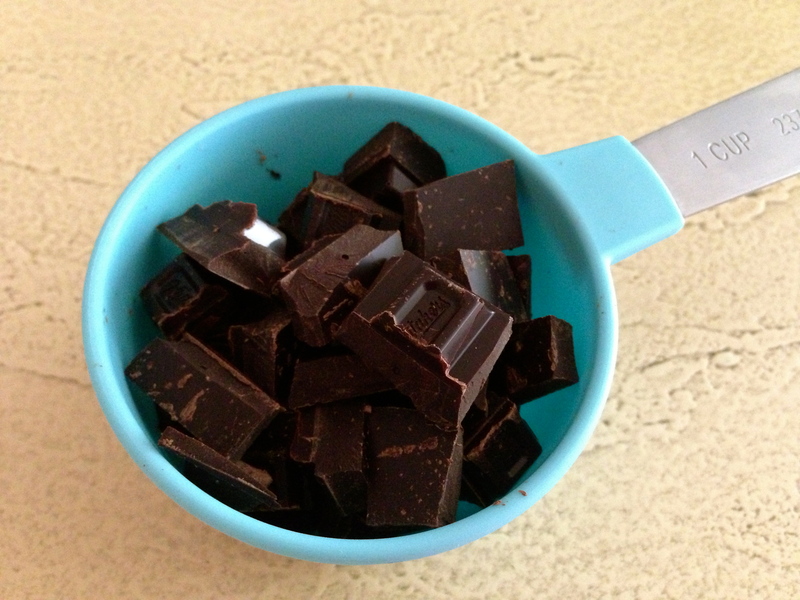 The most time consuming part was chopping all that chocolate up. And by “all that chocolate”, I mean only half the amount of chocolate as required by the recipe (recipe asked for 300g of milk chocolate, I used just under 150g). I also used less than half the amount of brown sugar (130g as opposed to 300g) and much less than half the amount of marshmallows (two handfuls rather than 225g). The fudge turned out lovely and creamy and very, very sweet. It makes me feel a bit sick to think how much sweeter it would have been if I had followed the recipe exactly. I have a massive sweet tooth but how does anyone stomach THAT much sugar? Despite not being the biggest fan of fudge, I enjoyed learning how to make it and actually learning what ingredients are in it, something which I had no idea of a day ago. You know a particular food is good when I, a lover of ribs and bacon, choose a vegetarian dish over one with meat in it. I’ve developed an intense love for falafels, probably because one of the restaurants I go to with Andrew does really amazing falafels and hummus AND flatbread. 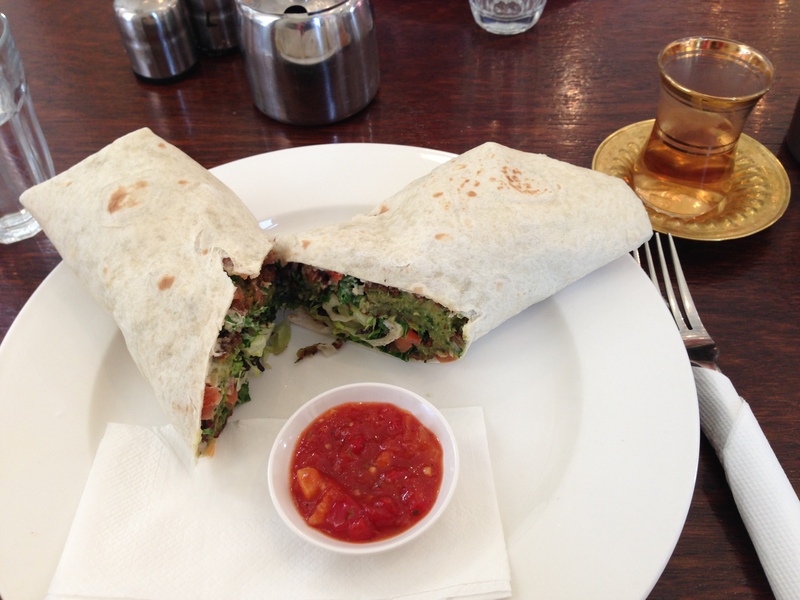 Also, I can’t believe I hadn’t discovered the deliciousness of Turkish apple tea earlier than 2 weeks ago – shame on me! Last night, I made dark chocolate soufflés and I think I realised as I was eating it that I actually don’t like making or eating stuff where the main ingredient is beaten egg whites. 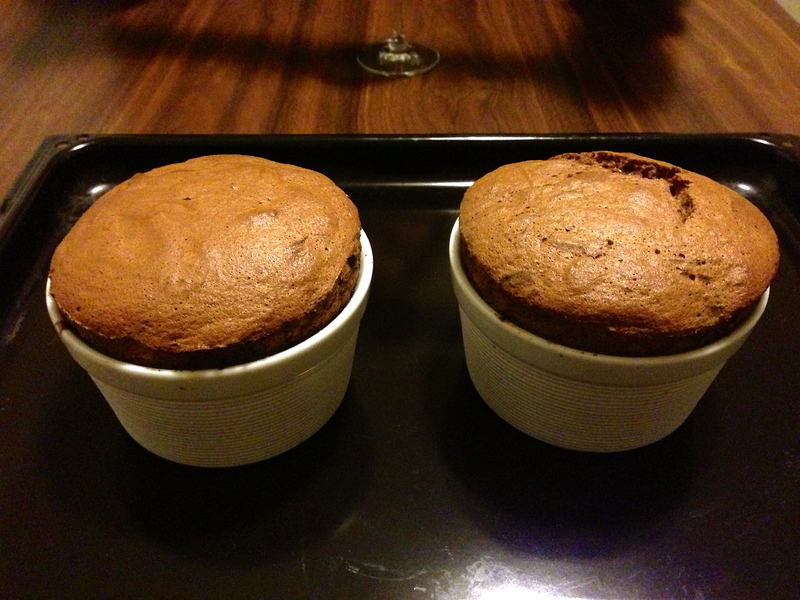 I just felt that the effort required to make the soufflés wasn’t entirely worth the ultimate experience. 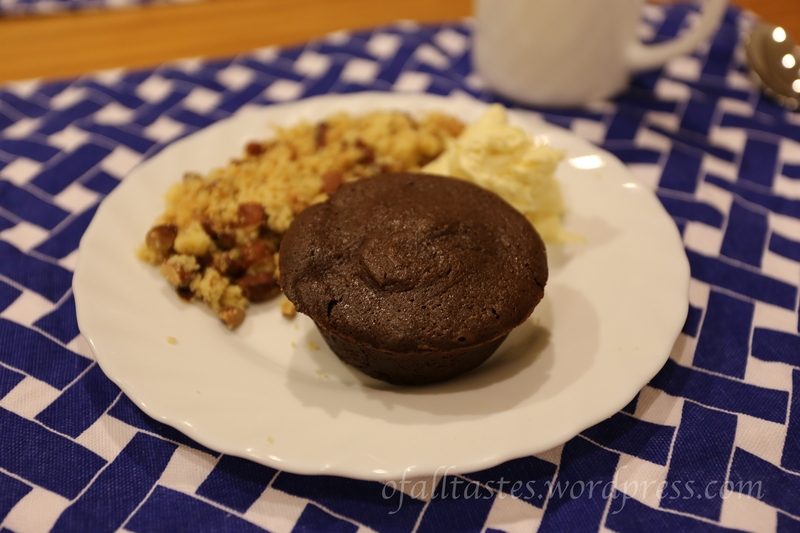 There was a general consensus around the table that the choc fondants I made on Friday night were a lot better, although this was also the first time I had made soufflés so I may not have made them as well as I could have. The recipe I followed seems great though, so if anyone is interested…! I’m not sure what my next cooking/baking attempts will be but I have quite a lot of heavy cream left, a request for onion and cheese pie and another for sushi. What to do, what to do…..
Has it really only been something like 3 months since I first started my postgrad course? It feels like it’s been much longer given how much work we’ve all had to complete over the past couple of weeks. Today was the last day of the first semester and I felt a small wave of relief as I walked away from uni having handed in my last assessment. Alas, as I sprawled myself over the floor of my living room, I realised that I had in fact stuffed it up. Not majorly, but considering how simple it was, it really annoyed the hell out of me. I’ll have to sort it out at some point but right now, I’m just hoping my dark chocolate fondants turn out alright when I go to bake them. I went to a Japanese-fusion restaurant, Ebisu, a while ago with my boyfriend and parents and I had my first chocolate fondant (the Feature Image). It was served with cherry compote, vanilla miso and macademia nut ice cream, all of which tasted fantastic. The only things I knew about fondant before this meal was that it’s baked so it’s cake on the outside and melted chocolate on the inside, and it’s really crucial to get the middle gooey, otherwise Masterchef/My Kitchen Rules/Top Chef judges will be incredibly disappointed. Based on this understanding, the fondant I had at Ebisu would have really “wowed” the judges. Unfortunately, based on how my own mixture turned out just now, my chocolate fondant will probably turn out more like cake. The mixture looked more like mousse – oops!